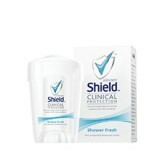 Shield Clinical Protection is a unique soft solid antiperspirant cream with TRISOLIDtm technology for 48 hour clinical strength odour and wetness protection. Whether it is heat, stress or life making you perspire, Shield Clinical Protection will keep you fresh and dry no matter what the day brings. Shield products can be found in Clicks stores in South Africa, Namibia and Botswana. Shield Clinical Protection is formulated with revolutionary TRIsolid™ body responsive technology that contains three important components: √ Clinical Strength Wetness Protection √ Patented Encapsulated Odour–fighting technology √ Skin moisturising ingredient Price: R69.99 Availability: Selected retail stores and pharmacies.